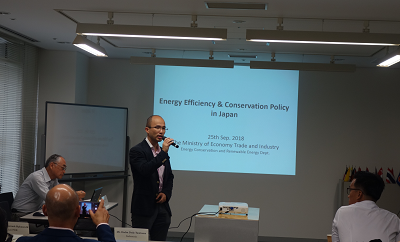 Under the instruction and financial support of the Ministry of Economy, Trade and Industry (METI), the Energy Conservation Center, Japan (ECCJ) implemented the following activities as an initiative in the AJEEP (ASEAN-JAPAN Energy Efficiency Partnership) Scheme 2 by inviting 10 persons in charge of the policy at nine ASEAN countries to visit Japan for training during the four-day period between September 25 and 28, 2018. (1) Reporting and sharing of information by persons in charge of the policy at ASEAN countries regarding their country’s energy conservation situation, roadmap progress condition, and the details of the activities of certified trainers. (2) Discussions on building a sustainable qualified energy manager certification system unique to ASEAN. (3) Expression of appreciation to Thailand regarding their kind permission to utilize their Mini Plant in the activities, and the awarding of a commemorative plaque to the Thai representative. 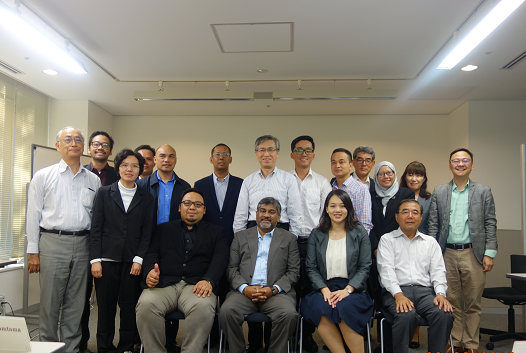 As a part of the new Scheme 2, 10 persons in charge of the policy from nine ASEAN countries were invited to visit Japan, where the following training was implemented to promote the capacity building program which contributes to the enhancement of qualified energy manager training together with the building and improvement of qualified manager certification systems in the 10 ASEAN countries. (1) From the country reports of each country, participants reported their country’s energy conservation progress situation, roadmap progress condition, and the details of the activities of certified trainers for the purpose of information sharing. 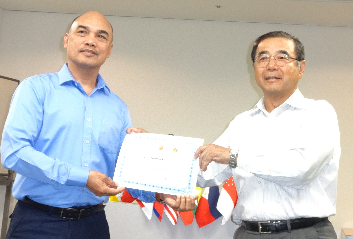 (2) As to the intended completion of the qualified energy manager training program in 2020, requests were received from the various ASEAN countries that they wished to continue with these activities. In response to the requests, small group activities were formed to start discussions on building a sustainable qualified energy manager certification system unique to ASEAN. In order to receive approval at the next fiscal year’s ASEAN Ministers on Energy Meeting (AMEM), optimum proposals will be developed for each country through investigation of the details, confirmation of the schedule, and activities in working groups. (3) As an expression of appreciation for the cooperation received from Thailand so far, a commemorative plaque was presented to their representative.